An ARC News Service report. – Emily Nicholas described the problems facing young people in rural areas when she spoke at the Rural Summit at Tennants Auction Centre in Leyburn on Wednesday, November 19. One of the problems was transport and Kevin Holt reported on the assistance young people were receiving through Wheels2Work and Richard Owens of North Yorkshire County Council’s integrated passenger transport department explained how some bus services were being retained by working in partnerships and with the help of volunteers. 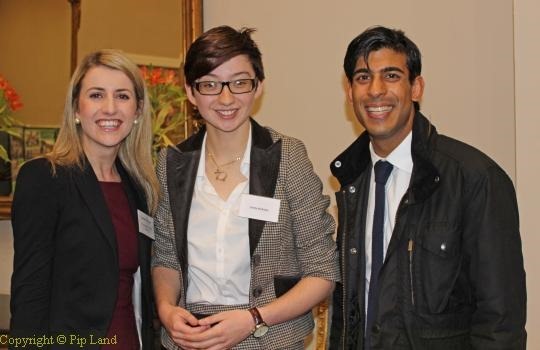 Below: Emily Nicholas (centre) with Kayleigh Thompson, Richmondshire youth council lead, and Rishi Sunak, the Conservative parliamentary candidate for Richmondshire. She outlined the problems facing young people in the Dales: transport including bus, cycle and pedestrian routes; education and apprenticeships; housing; childcare; local youth services; health and especially mental health care; and access to hospital facilities. She told the summit that there were 12,000 under 19s in Richmondshire and 16,500 who were under 24. But “young people” was very much an umbrella term and those over 18 had very different issues to those under 18. A friend of hers has also has difficulty travelling to Harrogate where he is employed as an apprentice. “I think it’s important to increase the number of apprenticeships in the area,” she added. The cost of transport also stops young people accessing leisure, personal development activities and local youth services – or even the opportunity to meet with others like herself to discuss the problems they faced and how to overcome them. Emily praised Kayleigh Thompson for all the work she had done in the past six years as the lead for the Youth Council in Richmondshire. “It gives young people a chance to talk about what affects them,” Emily said. She reported that many young people also gave up a lot of their leisure and social activities as it took so much time trying to achieve their educational objectives. It was often not possible for young people to study for A levels locally and the only university in Yorkshire was at York. She warned that when young people left the area to study they might not come back. She agreed with Andrew Fagg that if they did return, even after a short time away, they might not be easily accepted back into their community. And, of course, they faced the problem of finding somewhere to live. “The vast majority of young people have very little or no disposable income. Rents might be really low but if you’ve got no money that really doesn’t help. What is going to happen in the interim when (searching) for a job which will allow them to pay their rent?” she asked. Alongside affordable housing there needed to be easy access to services including childcare and hospitals. She also emphasised the need for mental health care and said: “It’s difficult enough growing up but on top of that there is the social isolation that comes from living in a rural area. Kevin Holt, the chief officer for Wheels2Work, agreed with Emily about the problem of transport. He said that a census had shown that only four per cent of those travelling to work in Richmondshire did so by public transport, half of those by bus and the rest by train. The majority (64 per cent) used private journey with 30 per cent walking to work. Many depended upon friends, family and neighbours for transport to hospital, with others using formal car schemes. They were grateful to all the volunteers who helped with such schemes, including those who drove the community buses. And hundreds had benefitted from the Wheels2Work scheme. “For those over 16 having such wheels is a stepping stone to getting a job,” he said. Richard Owens, assistant director of NYCC’s integrated passenger transport department, told the summit that the county council wanted to make sure that residents had access to a whole range of services – both conventional and non-conventional. He said that in Skipton the county council had started to run its own bus service on weekdays when a commercial operator ceased trading. It was now working with a local community group to try and get volunteer drivers so that the bus service could also run on Saturdays.